Protection: Over charge, over discharge, over current and short circuit. Protected 16340 (CR123) sized batteries with a nice current output. The curves tracks fairly well. The batteries handles 2A, but 3A is a bit much. I did not succeed in tripping the over current protection, it will probably trip on a direct short. The over discharge protection is still very useful. 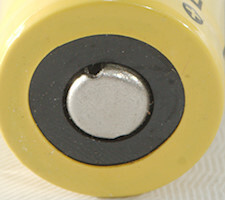 The battery has good capacity and can deliver a fair amount of current, but it not a high current cell. 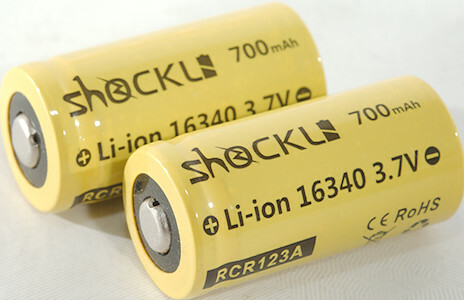 The batteries was supplied by Shockli.com for review. Nice cells. Thanks for the test! I’m still on the lookout for a cell of the performance of the AW 16340 “15C” that you tested two years ago but is long ago discontinued. This one is not it, but do you have 16340 cells in the pipeline that may have that current performance? I do not have any 16340 in queue. Good high(er) current 16340s are hard to find. Just ordered these trustfires, not my favourite brand, but tests seem ok. Yes they look decent but only the AW 15C was able to run at 5A (and thus make 1400 lumen OTF of a pocket EDC, which is completely unneccessary and a lot of fun). Are these the ones you’re referring to djozz? I don’t know if the stock is the “real”, but in Alibaba there’s a lot of places with them aparently! BTW, HKJ, for the 16340s, I believe you’ll have the Sofirn 900mAh, right? Funny enough, seeing HKJ tests of both batteries (AW and AWT linked above) measuring them on 3A and 5A, the AWT seems to hang a little better. Am I wrong on that reading? @djozz, I found these searching around, not much info but appear to be the AW 16340 15C (doesn’t say 15C) and they’re on sale. Check it at 5 and 7 amps using the comparator. Funny enough, seeing HKJ tests of both batteries (AW and AWT linked above) measuring them on 3A and 5A, the AWT seems to hang a little better. Am I wrong on that reading? Look at the AW IMR16340 15C 550mah (red) 2016 Check it at 5 and 7 amps using the comparator. I was comparing the non PC version! The 15C version is labeled as 15C, and that label makes it different from the ‘normal’ AW 550mAh 16340 cell, no other visual differences. The batteries in the link do not have the lebel, and it is also not mentioned in the description. I have tried to order there, but it did not work for me. 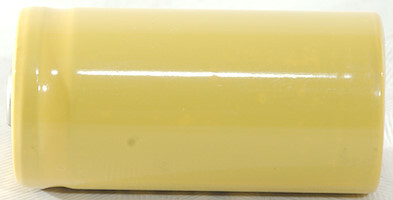 I can’t remember what went wrong, it was a few months ago, probably no stock despite the listing. 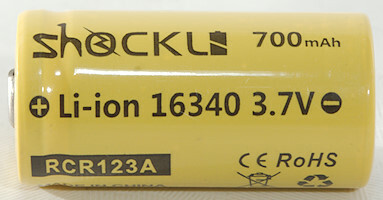 Thanks for HKJ’s hard work, I have a question for “Protected 16340 (CR123) sized batteries with a nice current output.”,sorry i do not give you the specifications. 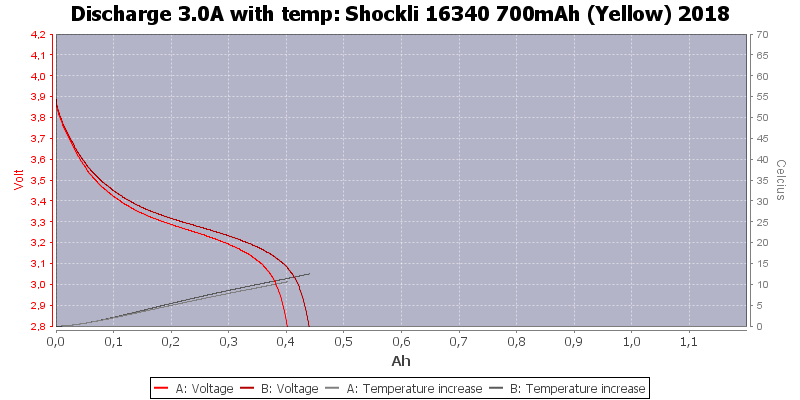 the shockli 16340 700mah is unprotected battery. I still have two decent 15C AWs. I’ll see how they compare. Not sure if hkj ever reviewed imren imr 700, but they are the closest thing to my aw’s. It’s in a blue wrapper and says 10 amps. How did you test them for the comparison to the 15C AW. Yup those are it. No real test with graphs or anything close. I have several high powered modded lights and I just did a simple lumen ceiling bounce test and the lumens were not too far off. And it was able to sustain the output pretty well also. Those Imren batteries look pretty good, and are even 700mAh. I ordered two button top Imren 700’s to try. I purchased them off ebay for 10 bucks shipped. I’ll try them out once they arrive. Hopefully u get authentic ones. How come you didn’t buy from Imr. I believe that’s where I purchased mine. Imr sells authentic cells. They been around since 1999 have over a quarter million sales with almost a perfect feedback and lots of good reviews, I’m guessing authentic and cheaper than Imrbatteries. If they test good, I may buy more but the shipping price doesn’t change or penalize you for only buying 2 cells to test. If they are not authentic, I get my money back. Says they are authentic in the description. I tested the IMR 16340 Imren at a 3 amp load. I got 340 mah at 7 minutes before tripping the 3v cut off. It’s about average with the other top name brand 16340 cell’s. 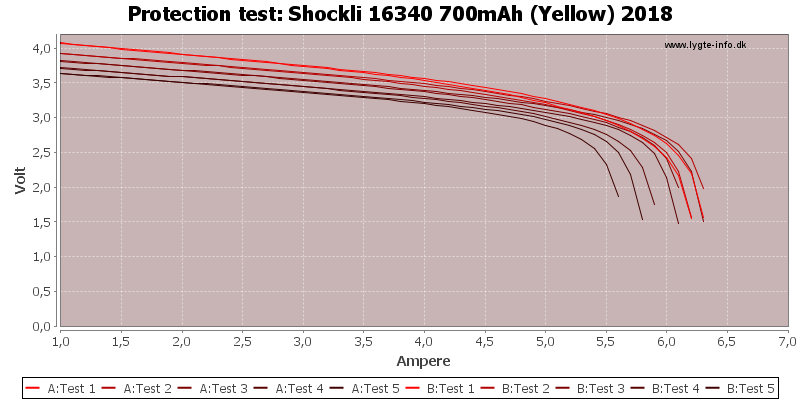 The IMR 16340 Trustfire (red-gold) is still the best 16340 cell I have tested at a 3 amp load. 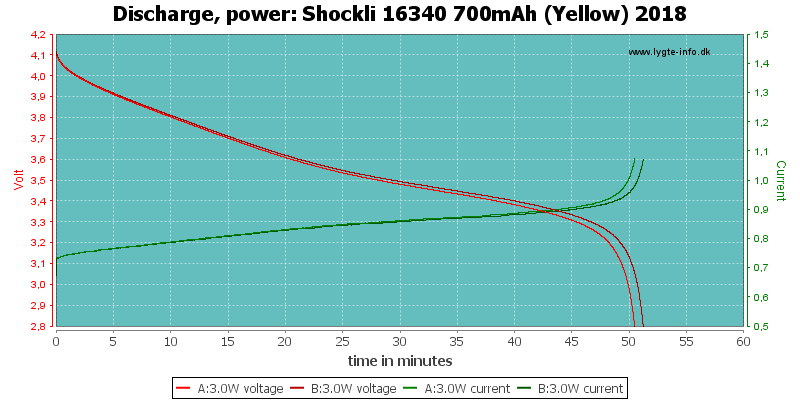 It did a little over 500 mah at 10 1/2 minutes at a 3 amp load. I just ordered 6 of the TF red/gold 16340s from FastTech and people just need to remember that on some of the older (and perhaps newer?) lipstick lights, with reverse polarity protection, the flat tops aren’t going to work. I always tell people that most good cells will test out well in the beginning, but the real issue is how many months do you get out of them before they’re trash? 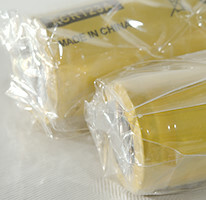 I won’t buy Kinoko, even if they’re still in business and I won’t buy Soshine any longer, because they didn’t last long for me. the shockli 16340 600mah would meet your requirements. 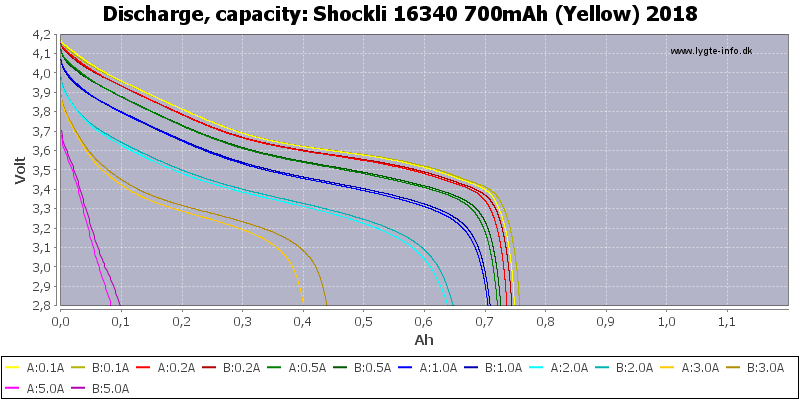 the capacity is over 500mah at 3 AMP load. 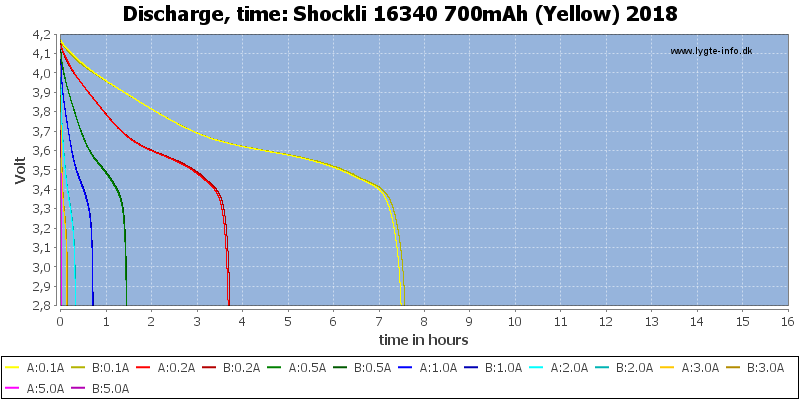 The shockli 16340 600mah have better performance than shockli 16340 700mah at high discharge current. 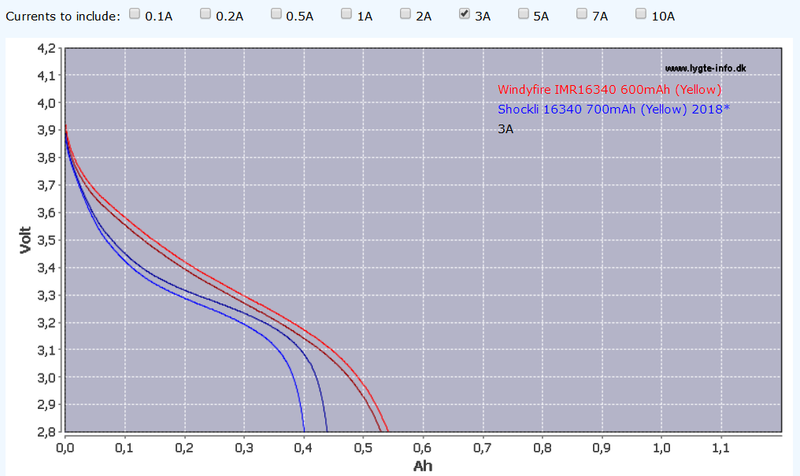 The link and HKJ’s graph both are showing the Windyfire IMR16340 600mah which looks to be a very good cell for high current drain in a 16340 battery format. Are you stating that Shockli is Windyfire or that Shockli is using the same cell. Its not very clear what you are stating the way it stands. 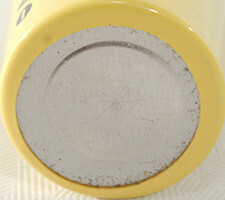 I also noticed that Mtn.electronics test review link also brings you to HKJ’s Windyfire test. 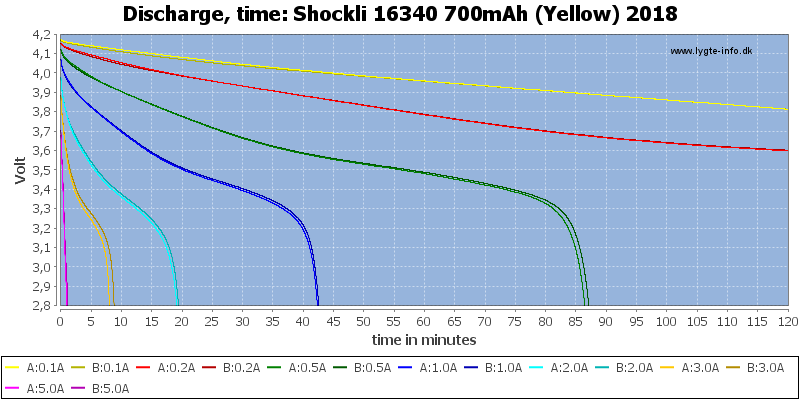 The link and HKJ’s graph both are showing the Windyfire IMR16340 600mah which looks to be a very good cell for high current drain in a 16340 battery format. Are you stating that Shockli is Windyfire or that Shockli is using the same cell. Its not very clear what you are stating the way it stands. I also noticed that Mtn.electronics test review link also brings you to HKJ’s Windyfire test. 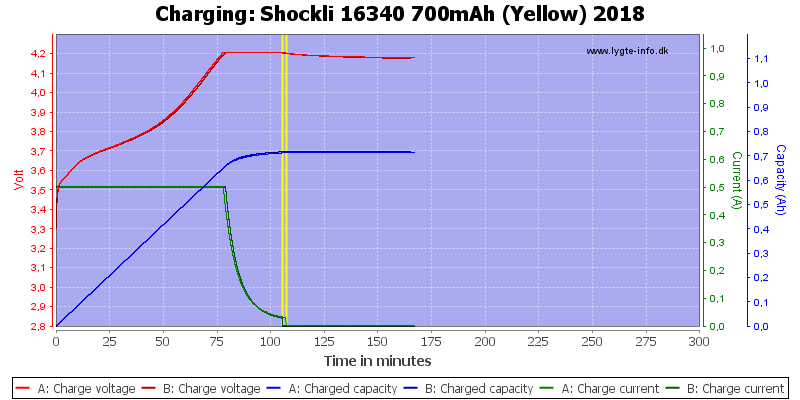 The shockli 16340 600mah and the windyfire 16340 600mah are the same cells. the capacity is over 500mah at 3A discharge current. I don’t know if Richard himself has used shockli 16340 600mah, i also want to know how the shockli 16340 600mah performance for the flashlight. 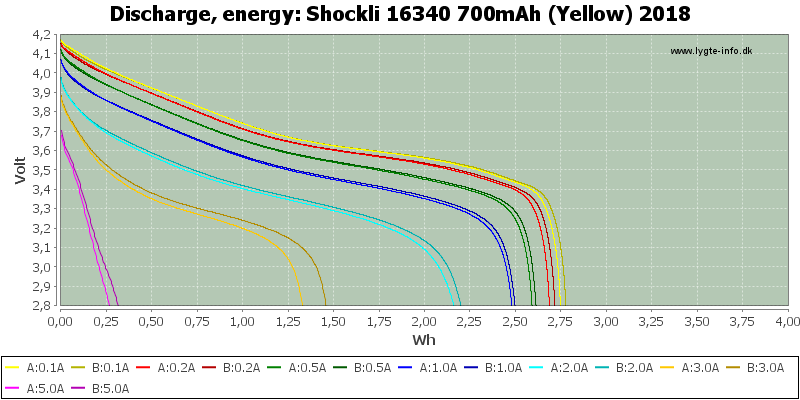 Has anyone budgetlightforum mumber ever used shockli 16340 600mah, would you share some information.